Amazing Japanese Map of the World, edited and updated by Ed Schnell in Yokohama. A remarkable 1862 Yokohama Published Japanese large format Japanese map of the world by Edward Schnell and Kango Takeda. This map is based upon an English map drown by John Purdy and others in 1845. Kango Takeda published a Japanese version of the chart in 1858. The present example is an updated version of the Kango Takeda publication revised by the Dutch/German arms dealer Edward Schnell - whose name appears on the lower right quadrant. 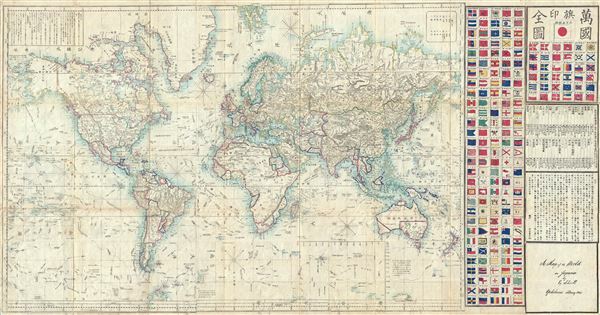 The map details the world with numerous Japanese notes and annotations, including the routes of prominent explorers. INI an unusual elaboration, this map also includes flag charts to the right of the map proper. Quite rare. The OCLC notes only 1 example in the Library of Congress. A second examples is held in the East Asian Library at U.C. Berkeley. We have no doubt this map has a fascinating story, which we will attempt to unearth in the coming weeks. Edward Schnell (c. 1834 - c. 1890) was a Dutch/German arms dealer active in Japan during the middle part of the 19th century/. He traveled there with his brother Henry Schnell following the enforced opening of Yokohama to foreign trade. Edward, who in the 1850s had served in the Prussian Army and spoke Malay, must have arrived in Japan aroung 1860 and took a Japanese wife Kawai Tsugonusuke, with whom he had a boy and purchase property, 'Lot No. 44,' in Yokohama. He teamed up with the Swiss watch dealer Perregeux presumably until 1867. Edward and Henry Schnell also served the Aizu domain as a military instructor and procurer of weapons. Edward was granted the Japanese name Hiramatsu Buhei, which inverted the characters of the daimyo's name Matsudaira. Hiramatsu (Schnell) was given the right to wear swords, as well as a residence in the castle town of Wakamatsu, a Japanese wife (the daughter of a Shonai-han retainer), and retainers. In many contemporary references, he is portrayed as wearing a Japanese kimono, overcoat, and swords, with Western riding trousers and boots. Very good. Some worm holing and wear on original fold lines. OCLC 5569126. Univ. of California Library, Berkeley, East Asian Library, A14.